A really common question I get when I work with buyers is “Where would I be able to buy groceries?” I am happy to say that if you buy a home in Lake Oswego you will have an abundance of choices. 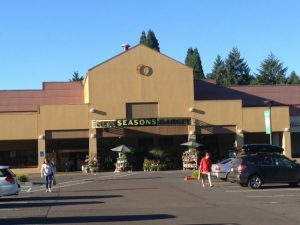 Seriously, within the city limits of Lake Oswego there are 2 Safeways, an Albertsons, a Whole Foods 365 Market, a New Seasons, a Trader Joe’s, and a Zupan’s. 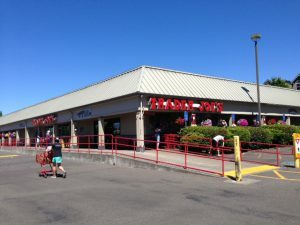 And if you are willing to go about 2 miles outside of town there is a Fred Meyer’s, a Whole Foods, a Winco, and a Costco. Then if fresh and local produce is your desire, there is the Farmer’s Market that runs from May to October, and Parson’s produce stand that is nearly all year around. We are so fortunate to have so many choices. I think back to what was available when I was growing up and it really seems so limited. Today you can find ingredients to eat completely organic, vegan, nearly every style of cooking, and from nearly every country in the world, all in our local markets. 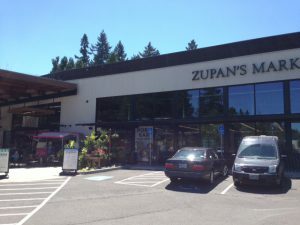 What prompted me to write this post is that I have discovered the Poke bar at Zupan’s. I was introduced to Poke while in Hawaii about 10 years ago. I am huge fan of sushi but not necessarily of all of that white rice. Poke is raw cubed fish, usually tuna, that is the tossed with a dressing. There are lots of different versions some of which are hot and spicy, savory, creamy, just generally yummy. 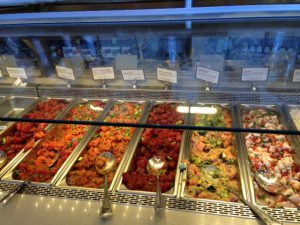 The Poke bar at Zupan’s is self serve next to the salad bar. They have about 6 flavors. It is just delicious. As for sushi, I can find 4 different sushi restaurants within a mile of my house. Yes! I do love living here!